Watch: Yasiel Puig is hit by a pitch, inciting benches-clearing argument. Yasiel Puig was hit in the left shoulder by a pitch from St. Louis Cardinals pitcher Adam Wainwright in the third inning of Game 1 of the National League Championship Series on Friday at Dodger Stadium, inciting a benches-clearing argument between the two teams. There’s a history. Puig and Hanley Ramirez — twice — were hit by pitches in the most recent regular-season series between the teams in July. Last October, Ramirez was hit in the ribs by a pitch from St. Louis Cardinals pitcher Joe Kelly in Game 1 of the National League Championship Series. After sitting out Game 2, Ramirez attempted to play hurt in the final four games of the series but was not a factor. Friday, Wainwright brushed Ramirez back with a pitch in the first inning, provoking Ramirez to glare at the mound. Ramirez later lined out to third base to end the at-bat — and the first inning. This incident was relatively tame. Dodgers outfielder Matt Kemp and first baseman Adrian Gonzalez both left the bench in an uproar. Along with Puig, they took turns shouting at Wainwright and Cardinals catcher Yadier Molina. Both managers and coaches from both sides successfully got between the yelling players, and the argument died down after a few minutes. Puig later came around to score on a single by Ramirez. That tied the game 1-1. Ramirez stole second base and scored on a ground-rule double by Carl Crawford, giving the Dodgers a 2-1 lead. The Cardinals took a 1-0 lead on a solo home run by Randal Grichuk in the first inning against Clayton Kershaw. After brawl, Erisbel Arruebarrena assigned to Single-A Rancho Cucamonga. Erisbel Arruebarrena‘s rehab assignment at Triple-A Albuquerque came to a violent end Saturday night, when the 24-year-old infielder incited a massive brawl in the Isotopes’ game against the Reno Aces. Sunday, the Dodgers activated Arruebarrena from the 15-day disabled list and re-assigned him to Single-A Rancho Cucamonga. The timing of the move, one day after the brawl, suggests this is more than a coincidence. Arruebarrena had not been performing badly at Albuquerque. He hit his first Triple-A home run Saturday — his slow home run trot might have provoked Reno to begin with — and was batting .351/.410/.486. Albuquerque is playing Reno again tonight and Monday. A source with knowledge of the situation said there is no precedent for a player on a major-league rehabilitation assignment being suspended by the Pacific Coast League. Nonetheless, the league is reviewing the incident and is expected to discipline Arruebarrena. It’s unclear whether or not he would be required to serve his suspension while playing in a different league. 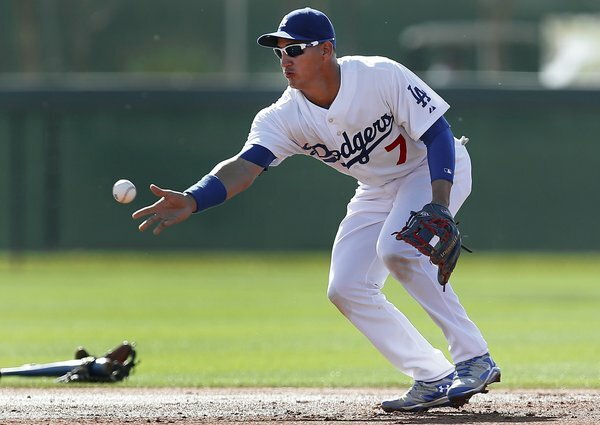 Alex Guerrero returns to Triple-A, “has a chance to be up here,” per Dodgers GM. SAN FRANCISCO >> Alex Guerrero‘s long road back from a vicious dugout fight in May has taken him back to Triple-A Albuquerque. Guerrero’s rehab was transferred from Single-A Rancho Cucamonga today to Triple-A. The Isotopes are playing a game tonight in Reno, Nevada. It was in a game with Albuquerque that Guerrero had part of his left ear bitten off by Miguel Olivo in the visitors’ dugout in Salt Lake City. “There’s a good chance had he not had the incident, he probably would’ve been here by now,” Dodgers general manager Ned Colletti said. Padres unite Ian Kennedy, Carlos Quentin in trade with Diamondbacks. The Dodgers haven’t completed any trades this morning, and don’t appear to be close on any either. They have had some interest in making trades within their division, but that’s a difficult proposition. Especially when you’re in first place, the rest of the division trying to knock you off your perch. That didn’t stop the Arizona Diamondbacks and San Diego Padres from pulling off a rare intradivision swap Wednesday morning. The Padres receive starting pitcher Ian Kennedy, while the Diamondbacks receive relief pitcher Joe Thatcher, minor-leaguer Matt Stites and a draft pick. The trade unites Kennedy and outfielder Carlos Quentin in San Diego, the two players responsible for inciting benches-clearing brawls with the Dodgers this season. Daily Distractions: Contemplating Kershaw contracts; Dodgers-Yankees; Yasiel Puig. 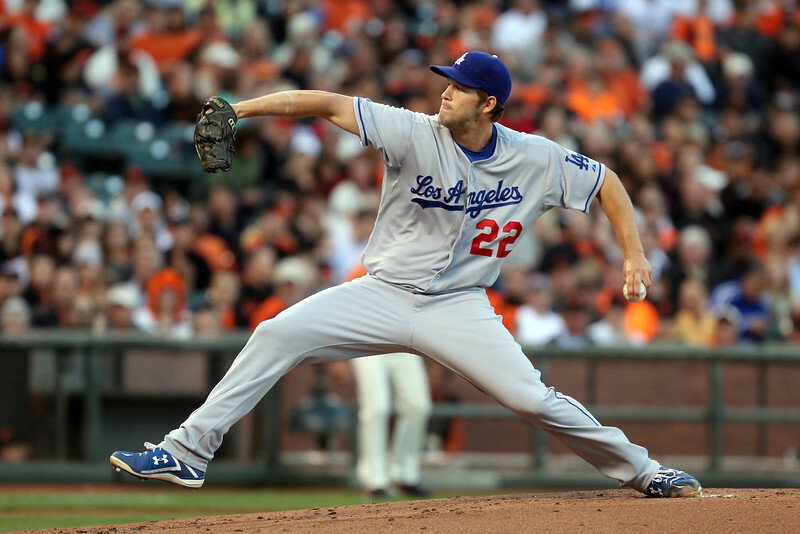 Clayton Kershaw and the Dodgers are talking about a contract extension. One side or both might be getting antsy. At least, that’s often the case when the terms of a deal are leaked to the media: To achieve something that negotiation cannot. Kershaw said the leak came from the Dodgers’ camp, not his. Regardless, there’s not a whole lot we can read into the reports on CBSsports.com and FoxSports.com, mainly because the two stories differ on the dollar amounts being discussed and the likelihood of a deal happening in the near future. If — and this is a fairly big if — Kershaw is seeking “about $225 million,” as CBSsports.com reports, he probably wouldn’t prefer the 10-year or 12-year contract structures mentioned on FoxSports.com, which would almost certainly lock in Kershaw to a longer term than he’s seeking. Those terms were more likely to have been proposed by the Dodgers. Again, this assumes the two reports are both drawing their separate information from reliable sources. Is it wise to invest 12 years in a 25-year-old pitcher who has already thrown more than 1,000 major-league innings? In any player? These are legitimate questions here. The Dodgers have probably asked them internally. At some point, we might discover what conclusion they reach. Does Kershaw think he’s worth 12 years and $300 million? Ask him yourself in about an hour.